I remember sitting in my home office and watching my fluffy white terri-poo Joey stand up. The little lump that I had felt on his back leg a few days prior was suddenly huge! How did that happen in just a few days? What was even worse was that there was some spots of blood on his dog bed. I checked the lump and it had cracked open. I’m not sure if Joey had been scratching at it or it just opened because it had grown so big so fast, but there was a foul odor coming from it. I immediately got him in to see my vet who suspected cancer. Even if it wasn’t cancer, it needed to be removed as quickly as possible to avoid infection so he was operated on the next day. Turns out it was cancerous and a fast growing kind. Fortunately though, it was isolated and hadn’t gone to any other organs so he didn’t need radiation or chemotherapy. Joey was 13 when this happened and despite the warning from my vet that it would probably come back, it never did. He lived almost another 6 years. Cancer can strike almost any animal, and our pets are no exception. Like many diseases, cancer is more common in older animals, but can affect pets of any age. So, without getting alarmist or paranoid about it, you want to be on the alert for possible signs of trouble. 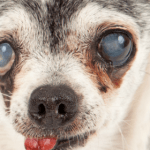 The possible warning signs of cancer in chihuahuas are about the same as for any dog, and can also be potential indicators of a wide array of other health problems. 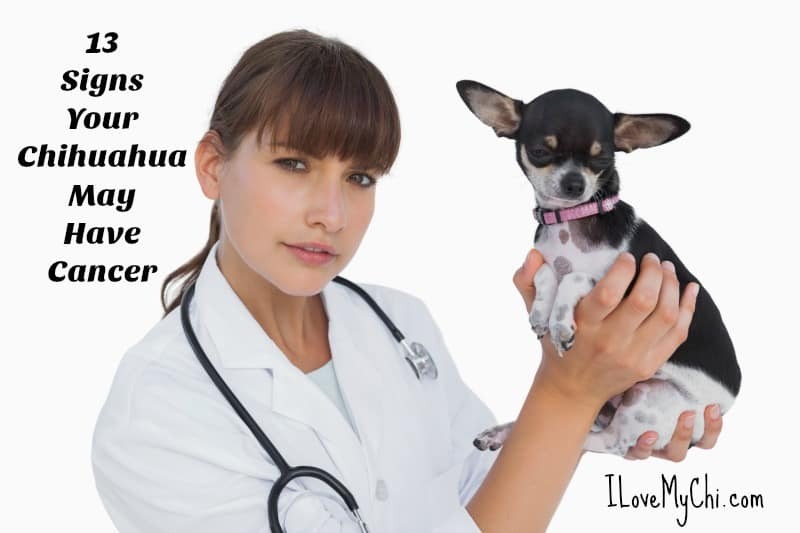 Only your veterinarian can determine for sure. By all means, if you spot one of these signs, have your vet check it out. It might mean nothing more than a minor issue, and knowing that would contribute a lot to your peace of mind! 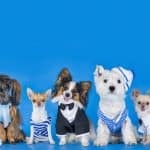 Can cancer in dogs be prevented? Not always, and not consistently. 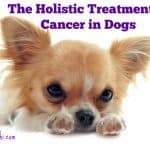 Of course, a well-cared-for dog such as yours will present fewer health problems generally, but cancer does not always respect your best efforts. While the incidence of certain cancers such as ovarian, breast, and testicular cancers can be nearly eliminated by early spaying and neutering, those operations may actually increase the risk of of other forms of cancer. 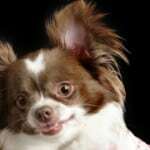 Are all dog tumors malignant? Certainly not – no more so than in humans. Your vet can advise you on the best way to deal with benign growths. 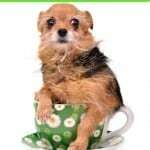 Can dog cancers be treated? Often, yes. Admittedly, treatment is not guaranteed of success, and can be expensive. But it is often worth a try. A good veterinarian will present you with the full range of options from the least to most aggressive and the least to most costly. 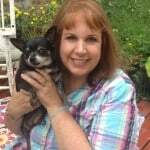 Although sometimes there is no avoiding the worst scenario, in many instances it is worth fighting for our chihuahuas. If we can gain them more years of life with no significant loss of quality, both we and the dogs are winners. Ugh….cancer….we’ve lost two dogs to it, and our golden retriever is fighting it now. She had lumps on her side that grew quickly too, and ended up having two surgeries to remove them, as in her case they did come back after the 1st surgery. However, the first was over a year and a half ago so she’s been fighting on! It came back a third time though and we didn’t want to put her through another surgery. It is currently spreading throughout her body, but right now she is still feeling good so we are just making the most of the time she has left. Catching it early can definitely make a difference. I’m so sorry Jan! I have heard that Goldens are prone to cancer. Cancer is such a horrible things to deal with in dogs and people too. So glad Joey had done well with the treatment. I just lost my one Siberian Husky this past December quite suddenly to hemangiosarcoma. No signs. Very shocking. And this post is so timely because my other Husky I just found an “oddity” behind her dewclaw. It was an infection we treated with antibiotics. Thought it had cleared, when a few weeks later, a lump appeared that began bleeding. It was a tumor and X-rays showed it was eating into the bone. We had it and the dewclaw removed this past Monday, and the pathology report came back and thankfully it is benign. Cancer is so, so scary. I’m so sorry you lost your Sib. That’s scary when there isn’t any warnings. Your pups are beautiful! I’m glad that you were able to get Joey’s treated in time and it didn’t come back. Cancer is such a terrible disease. Yes it is terrible Beth. Thanks for visiting! I’m glad you were aware of the changes that happened with Joey so he could be treated quickly. And I’m glad he did well with the treatment. I am constantly on alert for lumps or bumps on my guys and have them checked out at the vet. Labs in particular have a tendency to fatty lumps but it’s still scary when you find them! 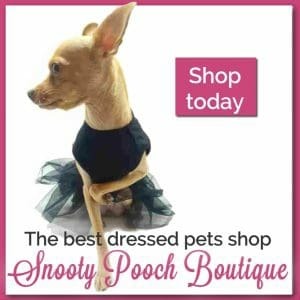 Thanks for sharing this in the Pet Blogger Showcase. 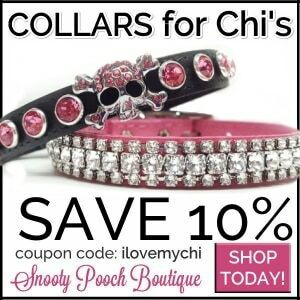 My chi is 11 and has had blood in his urine and leaking blood for 2 months. He has been vet checked and on two rounds of antibiotics. Nothing has stopped bleeding. Had xrays and no masses. Poor little guy! The vet has no idea what’s causing the bleeding? 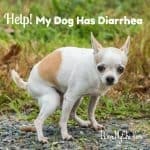 We took our chihuahua to the vet about a month ago for blood in his urine. The vet prescribed him some antibiotics for 10 days and it cleared up. Just got up this morning (about a week and a half after his meds were done), and found blood on his potty pad again. Being that it’s the 1st of the year, they are closed and I will be calling first thing in the morning. There was no urine test done when we took him in, so maybe it was the wrong kind of medication? Maybe it wasnt enough to clear it completely? Kidney or Bladder stones? Im just sick with worry. =( As horrible as it sounds, he likes to eat his poop. Can that cause UTI’s? I sent a photo of the babies watching TV with Mom. =) The one in question is the black and white one. I’m not a doctor so take anything I say with a grain of salt but it could be stones, a UTI or the start of kidney or bladder cancer. I’m praying it’s something minor that can be easily cured.